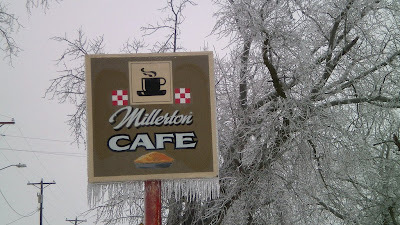 A dining guide for Wayne county told me to check out this cafe with a humble exterior in the small town of Millerton. I think this place was named Rose's Cafe before a renovation a year ago, and there seems to be only one other business open in town. A January day with a combination of freezing rain and dew known as Hoar Frost meant my photos were particularly colorless. Location: 11 Highway J-22 in Millerton, population 53, in Wayne County, Southern Iowa. Directions: The cafe is on the main street through town, County Road J-22, reached by State Highway 14 between Chariton and Corydon. The Tenderloin: Breading was golden brown with just enough flavor to compliment the meat. The pork was steamy warm and soft to the touch. It was thicker on one side, but tender throughout. Served with fixins on a toasted bun. Overall 8.0 out of 10. Also on the Menu: The menu is small and keeps is simple with burgers, pies and daily specials. Service: Table service with a couple waitresses running around. I think the owner was working the counter. Ambiance: This is a recently renovated and redone small town cafe with booth seats in one room and another dining room with tables. I think half the town was inside the cafe when I stopped in. Final thoughts: Finding a good tenderloin in a small town always makes a sandwich lover feel good about taking detours from the beaten path. This place could use a sign on the highway, because Millerton is a small town. When the Iowa town of Elkader was platted in 1846 in a small river valley surrounded by hills, it was named after Abn Al-Qadir, who was leading Algerian resistance to French Colonial rule at the time. That historical footnote was enough to encourage a multicultural couple, including the son of a former Algerian diplomat, to visit this small town in the bluff country of northeast Iowa while on their way to Cedar Rapids. The two loved the town and the people here enough to move from Boston to start Schera's Restaurant and Bar on the main street of Elkader. Directions: Elkader is where Iowa Highway 56 meets Iowa Highway 13. The roads in this part of Iowa bend around the hills and you can't just see a town under a water tower from ten miles away. Follow the signs for the Business District from either State Highway. The Tenderloin: The first thing I noticed was the size and classic triangular pork loin cut shape with some good thickness and golden brown exterior. The meat is warm, moist, and soft enough to tear easily. This is served with chopped red onions and romaine lettuce, better than most other places. They didn't go crazy with any special or strong seasonings in the breading here, but there is a good crunchy texture. Served on kaiser bun. Overall 8.0 out of 10. Price: $7.00 with choice of side. Also on the Menu: The menu is split between American food like hamburgers and Mediterranean staples like a gyros platter. The specialty is the Algerian dishes, like the Chicken B'Stilla pictured below. Its made from ground chicken, onions and seasonings, stuffed in phylo dough, then fried and topped with sprinkled cinnamon. The staff explains to patrons that the most common spice in Algerian cuisine is cinnamon, and I don't think anything here is really spicy. Service: Its table service, when I visited one of the owners was walking around the place asking patrons how things were. Ambiance: The building is a main street storefront with high ceilings, with tables, booths, and a bar for seating. The wood panelled walls have vintage pictures of Elkader, Abn Al-Qadir, and Algeria. I think they may have a patio facing the Turkey River in back when the weather warms up. The connected storefront beside the restaurant was being used as retail space when I visited. Final thoughts: Its no understatement to say a restaurant like this is uncommon in small town Iowa, and Schera's is definitely a special place. The story behind how the owners came to Elkader and decided to stay here was documented in detail in news clippings on their website, but the site is being redone right now. The owners have been dedicated enough to this place to restore the building after after a devastating flood in 2008. I get the idea that people travel from up to 40 miles away to visit this restaurant, and for good reason. A little over two years since the initial write-up, I was able to get back to Schera's in Elkader with my camera in tow for a follow-up. The menu seems to have undergone some changes with more bar food and a Sunday Brunch and Late Night section. The most impressive thing about my return trip is that this place has been operating since 2006 now. 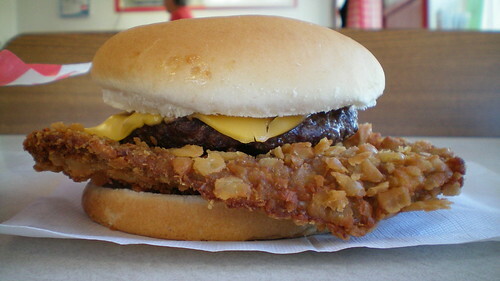 This is simply listed on the menu as Hamburger, and is priced at $7.00 with a little extra for your choice of cheese. There were two 1/4 pound patties with melted provolone. While other parts of the menu are only lightly seasoned, the ground beef here is mixed with salt and pepper and a little extra to give it a serious punch of flavor while eating. The beef had a nice dark char on the edges. Served on a homemade Kaiser Bun. The Bourek: This appears on many Bosnian restaurant menus in Des Moines, but those places serve it like a pie or pizza slice. Scera's Bourek was only lightly seasoned inside but the phyllo casing reaches a great brown color with great flaky crunchy texture. The interior looks like it has seen a number of small changes, probably done over time. The decorations still include pictures of Elkader and flags from Algeria. Now there are more beer signs and works from local artists hanging on the walls. A robot sculpture now greets patrons next to the daily specials on a chalkboard.